One thing you don't have much control over in your Mac is when and how the cooling fans start. They're automatically controlled by your CPU. However, smcFanControl lets the you set the minimum speed of the built in fans so that you can actually increase the minimum velocity to make your Intel Mac run cooler. Because this can be dangerous, smcFanControl doesn't allow you to go under a minimum speed (basically Apple's default) so that you don't risk burning-out your Mac! 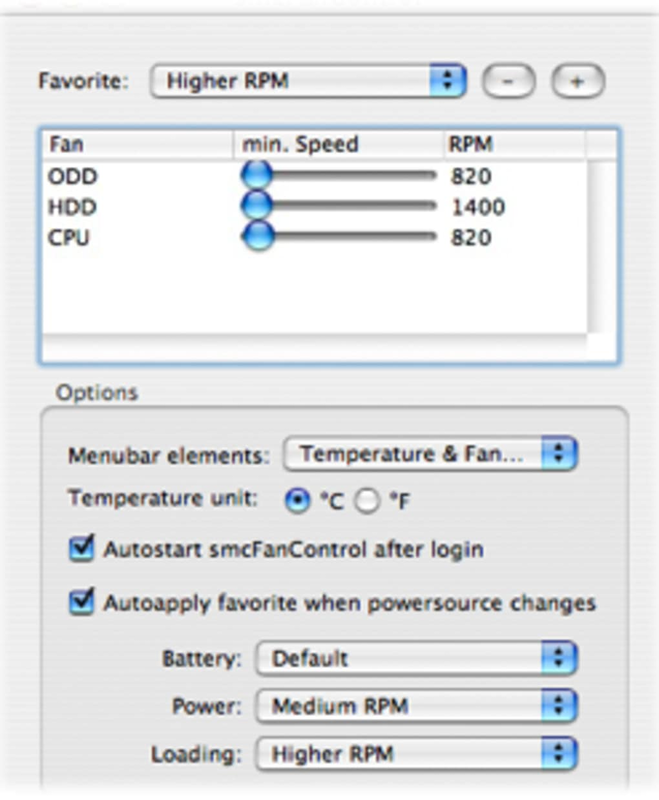 smcFanControl also doesn't override the automatic settings in your Mac so that your fans will kick-in when the CPU needs them. Apart from this, smcFanControl also displays the temperature and fan speed in the menu bar, lets you set different minimum speeds for every fan separately and alters them accordingly when the power source changes. Be warned though that messing around with your fan settings is to be done with extreme caution. Unless you work in a particularly hot environment, or feel that your fans are actually on too much for some reason, I'd be very careful before using smcFanControl. smcFanControl 2.2.2 should be fully compatible with the final release of OS X 10.6 (Snow Leopard). There are no known issues. Life Saver Software. Apple should have built something like this into the operating system. I run a project recording studio, yesterday was a very hot day we were tracking vocals.My Mac Pro has 14gb 800mhz DDR2 FB ECC Ram. started work this morning and the 'restart you mac' screen appeared after i logged in. Turned out that I only had 10 gig of Ram now. I diagnosed the problem to a particular Ram module. Lights on the Riser really help. I tried n in different slots and it appeared that only one module was damaged or defective. However because it was a 2gb module and the memory works in matched pairs my Mac was down by 4 gig. 2 x 1gb modules are stock Apple memory. 3 x 4gb Kingston (2gb x 2 kits). Totalling 12gb of Kingston. If only i was clued up to this software 24 hours ago. I just know the memory wouldnt have died. 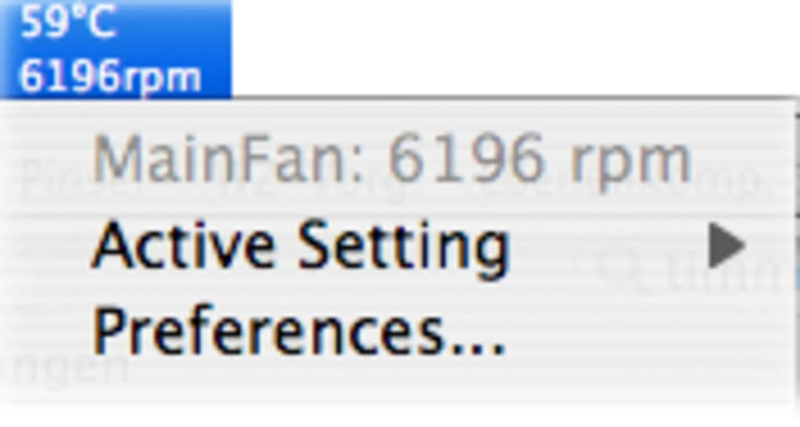 I didnt worry whilst tracking last night as i thought the Mac would have automatically adjusted the fan speed. Fortunately for me the supplier of the memory has agreed to replace the 4 gig Kingston kit within the next few days. Lucky the RAM was only 10 months old. I like the way it runs at the top of the screen and allows me to adjust profiles real quick. It doesnt change the speed instantly it builds up and slows down gradually which must be a good thing re fan wear.Profiles are really easy to create. For example, I have made one called 'Hot Day' where the fans run double the stock speed. One called 'warm day' where they run 200rpm above stock speed and finally 'Turbo Cooler' where they run at maximum load. cant I learn the easy way? Brilliant software.